As all cat owners know, cats are NOT small dogs! And when it comes to pain and pain management, this is certainly true. Fortunately for cats and the people who love them, veterinarians have made excellent progress in understanding cat pain and how to manage it. Most cats instinctively hide their pain as a survival mechanism. Most cats instinctively hide their pain as a survival mechanism. (Cats are, by nature, predators, and predators who can no longer hunt become another predator’s next meal.) In the past, this led well-meaning experts to presume that cats didn’t feel pain the same way humans do. We now know that cats have a nervous system very similar to humans, and we know better how to recognize and manage their pain. Pain experts define pain as "an unpleasant sensory and emotional experience associated with actual or potential tissue damage." In general, if something would hurt a human, it would probably hurt a cat. Pain is very subjective and difficult to measure, and there are as many manifestations of pain as there are injuries, conditions, and individuals. Demonstrations of pain vary widely among pets in general but are even more elusive in cats. In general, if something would hurt a human, it would probably hurt a cat. How can I know if my cat is in pain? With obvious injuries or after surgical procedures, we can reasonably assume that a cat will experience pain. Although the signs may be subtle, careful observation of a cat’s everyday behaviors will often reveal pain when it is present. A cat may decline to “go vertical,” avoiding the windowsill or the back of the sofa. A cat may decide that the stairs are too difficult to navigate and remain on a single level of the home. Some cats that are in pain will sleep more than usual, while others may be restless and unable to settle into a comfortable position. A cat that begins to soil out of the litterbox may in fact be feeling pain and is avoiding the step or jump into a high walled litter box. Keep in mind that arthritis pain is common in older cats and may be manifested in many different ways depending on the area of the body that is affected, yet it is very difficult for a pet owner to identify the source without professional help. Observe your cat carefully before visiting your veterinarian so you can report accurately the changes in behavior you are seeing. How is pain treated in cats? If your cat is undergoing a surgical or dental procedure, do not be afraid to ask what pain management will be provided. Most of these procedures require postoperative pain management, though the duration of treatment will vary with the procedure. Generally, your cat will receive pain-relief medications before, during, and after surgery or dentistry. Although there are fewer medication options for cats than for dogs, your veterinarian will choose the appropriate drugs based on your pet's specific needs. Nonsteroidal Anti-Inflammatory Drugs (NSAIDs) – These drugs interfere with the body's production of inflammatory molecules that trigger pain and swelling. NSAIDs must be used with caution because there is the potential for liver, kidney, stomach, and/or intestinal problems. NSAIDs are used to treat mild to moderate pain and discomfort. Never give your cat an over the counter NSAID as certain ones can be very dangerous. For example, acetaminophen (Tylenol) is toxic and can be fatal in cats. Opioids – Opioids are used for more severe pain. This class of pain-relief medication includes morphine, codeine, fentanyl, buprenorphine, and hydromorphone. Opioids are used to treat severe surgical pain and may also be used in advanced cases of cancer or to control severe arthritis pain. 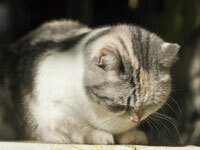 Opioids may play a role in maintaining a good quality of life for a cat with severe chronic pain. Corticosteroids – Corticosteroids, such as cortisone and synthetic cortisone-like drugs such as prednisone, prednisolone, methylprednisolone, and dexamethasone are potent anti-inflammatory medications. They may be used to reduce arthritic or allergic discomfort. However, they have potential long-term side effects and should be used with caution. There are new applications of existing medications, such as gabapentin and amitriptyline, that promise additional pain-relief options for cats. Your veterinarian will choose the appropriate drugs based on your cat's specific needs. Pain remains an enormous unmet medical need, for both humans and cats. By paying attention to behavior changes that may signal pain and by working with your veterinarian, you can help your cat enjoy a pain-free life!